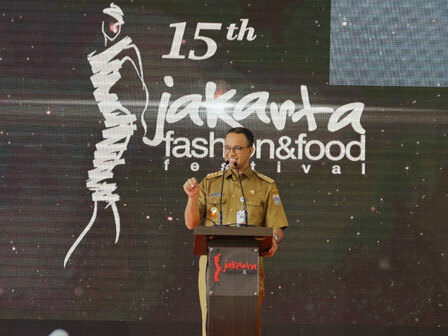 " We want Jakarta as a forum of creative circles"
According to him, the implementation of Jakarta Fashion and Food Festival (JF3) is a real collaboration between Jakarta Provincial Government and stakeholders to make Jakarta as a center of national expression. "This event is the fifteenth time held this year. We want Jakarta as a forum of creative circles," stated Anies, when he previewed the event at National Museum Building, Jalan Medan Merdeka Barat, Gambir, Central Jakarta, Tuesday (3/27). In the midst of the heterogeneity of the capital, he added, the city government is very committed to pay attention to the preservation and development of Betawi culture and culinary as the content of local wisdom. "I say, it shouldn't just be an annual event. We have to think about the effect of it to have a big impact," he said. In that occasion, it is also attended by Center National Handicraft Council (Dekranas) Chairman, Mufida Jusuf Kalla; Jakarta Regional Dekranas Chairwoman, Fery Farhati; Jakarta BKOW Chairman, Nur Asia Uno; and Jakarta Tourism and Culture Dept., Tinia Budiati.